The Lord of Terror turned 100 years old in 2011. 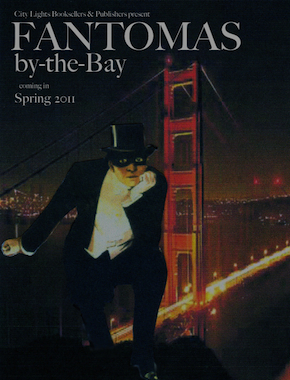 In San Francisco from April 6 - 10 of that year, Fantômas-by-the-Bay celebrated the centenary. The extravaganza of readings, multi-media presentations, theatrical performances, and rare film screenings was curated and organized by Peter Maravelis of the internationally renowned City Lights Books, and was sponsored by City Lights in conjunction with the Cultural Services of the Consulate General of France and the Mechanics' Institute Library. The festival featured historians Robin Walz and Dominique Kalifa, Fanto-aficionados Howard Rodman and Marc Ellis, graphic artist David King, scholar Jonathan Eburne, chanteuse Jill Tracy, author and musician Daniel Handler, puppeteer Janaki Ranpura, and many others—including the Lord of Terror himself. Hundreds of people attended the events and much St. George Spirits Absinthe Verte was tasted. Many thanks to Peter Maravelis and all the sponsors, participants and attendees for making Fantômas-by-the-Bay such a marvelous and illuminating event. For more on the world of the Fantômas novels and films go to Who is Fantômas? For more quick reference information to Fantômas in English, see the Wikipedia entry.